The stunning architecture and grounds of the Alberta Temple in Cardston, Alberta is a symbol of significance to the Mormon culture in Canada. 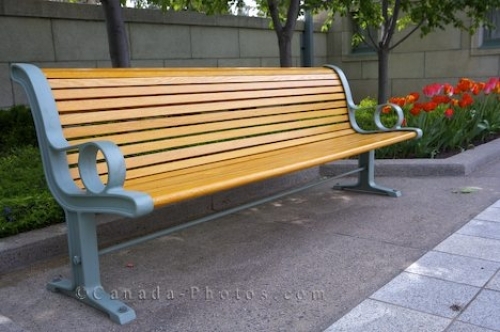 This elegant park bench is located near the gardens of the church where people can sit and take in the scenery. class="description">Park Bench in the grounds of the Alberta Temple, Church of Jesus Christ Latter Day Saints, in Cardston, Southern Alberta, Alberta, Canada. Picture a park bench amongst the blossoming tulips on the grounds of the Alberta Temple in Cardston, Southern Alberta, Canada.